A forthcoming book edited by CSLR Director John Witte, Jr. and CSLR Senior Fellow T. Jeremy Gunn examines the rich, complex history of the First Amendment’s Establishment Clause, which forbids the creation of a state-sanctioned religion. 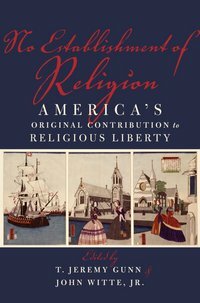 No Establishment of Religion: America’s Original Contribution to Religious Liberty (Oxford University Press, 2012), explores the original understanding and function of the 1791 Establishment Clause as well as the unique contribution it has made to American religious liberty. Given the continued debates concerning the religious foundations of the United States, this volume provides a much needed and fresh look at the reasons behind and the reception of the Establishment Clause. Containing 13 chapters from some of the nation’s most distinguished scholars, the book provides readers with a thorough and insightful history of the Establishment Clause and its evolution throughout the past three centuries. The chapters examine several crucial junctures in our nation’s history—from the ways in which some American colonies sought to disestablish religion prior to the 1776 American Revolution, to the understanding of the separation of church and state in the 19th century, to the current day conversations concerning the perceived dichotomy between “Christian America” and “Secular America.” This volume is part of the CSLR’s project on “Law, Religion, and Human Rights,” funded by the Henry Luce Foundation, Inc. Contributors for this volume include Thomas C. Berg (University of St. Thomas School of Law), Derek Davis (University of Mary Hardin-Baylor), Daniel L. Dreisbach (American University), Carl H. Esbeck (University of Missouri), Paul A. Finkelman (State University of New York, Albany), Steven K. Green (Williamette University), Kent Greenawalt (Columbia University), Gunn (Al Akhawayn University), Ralph Ketcham (Syracuse University), David Little (Harvard Divinity School), Martin E. Marty (University of Chicago), Mark McGarvie (University of Richmond), Michael W. McConnell (Stanford University). Witte (Emory University) provides the introduction. While the authors bring their unique—and sometimes differing—perspectives, “together, [they] hold up a wide canopy of responsible academic opinion on the genesis and genius of America’s original contribution to religious liberty. And together they expose the fallacies of viewing America as either a Christian nation bent on perpetuating biblical ideals or a secular nation built with a high and impregnable wall of separation between church and state,” Witte writes in the introduction. Indeed, the volume does not seek to provide readers with easy answers, but instead illuminate the complex history of religious liberty present throughout the scope of our nation’s history.